Historically, professional gardeners maintained the grounds of large houses and country estates, but at home mainly grew fruit and vegetables and reared livestock. However with the Industrial Revolution and Enclosure acts that stripped rural communities of land, traditional cottage industries declined and increasingly country dwellers sought employment in factories and mills. With more workers living in towns and cities from the early-1800s, often in overcrowded tenements, space was scarce and growing plants was limited to window boxes or a few vegetables in courtyards. As the densely-populated slums inhabited by poorer families bred disease and pollution, the expanding middle classes anxious to escape urban squalor began commuting via the new railway networks out to the fresh air and more spacious settings of developing suburbs. This trend advanced with the relative peace and rising prosperity of Queen Victoria’s reign: a comfortable home with private garden became a reality not only for the wealthy, but eventually for more ordinary working people seeking a better quality of life. The fashion for creating suburban gardens was fuelled by many factors and developed alongside the nation’s need to feed a growing population. Generations of gardeners had relied largely on their own observations and experience, but now advancing scientific research and knowledge led to greater understanding of how plants grew and thrived, heralding more modern methods of cultivation. These included considerable improvements to soil fertilisers and major breakthroughs concerning plant reproduction and, through cross-pollination, the breeding of superior hybrids. Man was able to manipulate nature to suit his own horticultural requirements. Scientific advances were matched by the technological progress of the age. From the 1830s, the Wardian case, a small portable glass-house, enabled exotic botanical species to be successfully imported into Britain following plant-hunting expeditions to the Far East, Africa and Central and South America. With the abolition of glass tax in 1845 and development of improved sheet glass, the prices lowered, making greenhouses affordable for many more plant enthusiasts. Additionally, new printing processes and the emerging profession of horticultural journalism inspired many instructive gardening periodicals featuring practical advice, as well as adverts for the diverse gardening products coming onto the market. Influential titles included The Gardener’s Magazine, founded in 1826 by botanist and garden designer John Loudon, and The Gardeners’ Chronicle, launched in 1841 by gardener and architect Joseph Paxton and John Lindley, botanist and orchidologist. Local and national newspapers published columns answering readers’ gardening queries and seed catalogues produced by a new generation of commercial nurseries now offered both familiar plants and novel varieties from distant lands. 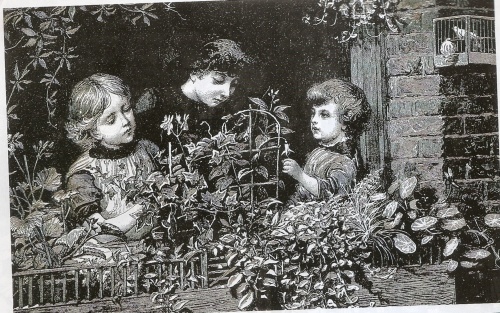 Victorian mass-production and cheaper metals led to the development of lighter tools, reducing some of the heavier physical aspects of gardening. A major innovation was the lawnmower, prior to which grass had been cut by men using scythes, or by using grazing sheep: now amateurs could maintain their own greensward, elevating the lawn to an admired feature in all gardens, large and small. First patented by Edwin Budding in 1830, various refinements occurred in the design and function of lawnmowers until a device with roller and cutting blade was perfected that could be managed by one person: this was mass-produced from the late-1860s onwards. Later, in 1893, the earliest petrol-driven mower appeared, followed by the rotary blade mower c.1899. Gardens reflected the eclectic tastes of the age and were heavily influenced by the availability of particular plants. Those of the early-1800s often followed the museum-like ‘gardenesque’ style of scattered trees and winding paths that celebrated new species and showcased individual specimens in beds where they could be admired from different angles. Flowers such as geraniums, marigolds and blue lobelia were already popular, and along with nasturtiums, poppies and sweet alyssum remained firm 19th-century favourites. Gardens were also increasingly enlivened with vibrant new species including begonias, petunias and verbenas from Brazil; scarlet salvias from Mexico; golden escholzia from California. These and other boldly-coloured compact plants were used to striking visual effect in domestic gardens from the 1840s, when massed bedding schemes of blocks of colour arranged into formal patterns came into vogue. As conifers and other evergreens were introduced, these also grew fashionable, the rare Monkey Puzzle tree a prized addition to many Victorian gardens following its commercial cultivation in the mid-1800s. New species of rhododendron appeared around this time too, prompting a craze for the flamboyant shrub, especially in wooded gardens. Ferns and other exotic foliage plants also captured the popular imagination and were effectively displayed in glass Wardian cases in genteel drawing rooms, or on a larger scale, in purpose-designed fern houses or glass conservatories. New alpine plants were also available from nurseries by the 1870s, inspiring enthusiasts to create ambitious rock gardens at home. During the 1880s and 1890s, bamboos, maples and flowering cherries reflected growing western interest in Japan and the oriental style of gardening. Fountains, ponds, bridges, urns and other diverse features, grandiose or rustic, contributed to fashions in planting and garden design, garden gnome figurines initially a curiosity introduced into Britain from Germany in 1847. One late-Victorian trend was for the ‘wild’ garden and by the early-1900s both formal Italianate and more ‘natural’ gardens were admired. Under the philosophy of the Arts and Crafts movement, garden planning aimed to link indoors and outdoors harmoniously, using complementary locally-sourced building materials and encouraging traditional local plant species. Planting was guided by art but achieved in partnership with nature, resulting in simpler, often informal schemes displaying old-fashioned cottage-garden flowers and shrubs such as lavender, rambling rose and hollyhock. The Edwardian preference was mainly for subtly blended shades of blooms, in stark contrast to the vivid hues of the previous century. Feminine influence on gardening was also stronger, with a new generation of professional female horticulturalists, including the famed Gertrude Jekyll and Ellen Willmott. During the early/mid-20th century many more homes were built on the fringes of expanding towns. Suburban houses usually had front and back gardens, the front typically colourful and formal, the back often abundant with fruit and vegetables that would feed the family and perhaps win prizes in local shows. Since the 1800s gardening had been considered a healthy and morally improving pursuit and everyone was encouraged to take part, including women and children. Different botanical species drift in and out of fashion, but gardening, therapeutic and relaxing, challenging and rewarding, remains a popular pastime for all.